Authors: D.R. Anderson et al. First Author’s Institution: Keele University, UK. My grandfather likes to tell the story of how he, an unknowing asthmatic, moved across the country in 1952 and nearly moved back again due to the Los Angeles smog. Although Los Angeles is iconic for its brown haze, it is not the only smoggy city in the modern world: Beijing, New Delhi, and Santiago ranked 1,2, and 3 in a recent air pollution survey. I could discuss the negative consequences of smog and the actions we could take to clean Earth’s air, but I won’t. Instead, I will talk about what makes smog and about how we can find the necessary conditions (or lack thereof) for creating smog on planets around other stars. Smog can only occur in an atmosphere with a temperature inversion. Usually, a planet smoothly radiates heat away from its hot surface through its atmosphere. Thus, the base of the atmosphere is warmest, and the temperature of the atmosphere gradually decreases with altitude. However, some atmospheres have temperature inversions, or layers of hot air higher up in the atmosphere that trap colder layers underneath. Rising air laced with pollutants becomes trapped in the lower layer, producing smog. What causes temperature inversions? On Earth, local temperature inversions are often caused by pressure systems (i.e. weather). High-pressure cells of lower-altitude air can produce local temperature inversions, such as the one over Los Angeles that my grandfather despises. Although we are beginning to learn about the weather patterns (such as “circulation,” which describes how global winds redistribute the heat from the dayside to the nightside of the planet) on other planets, we are not nearly so well versed in their effects as we are in Earth’s climatology, and even that is not particularly well known. However, we do have the ability to measure global temperature inversions on Earth and other planets. We have a global temperature inversion in Earth’s atmosphere that we call the stratosphere. Some exoplanets have similar temperature inversions. 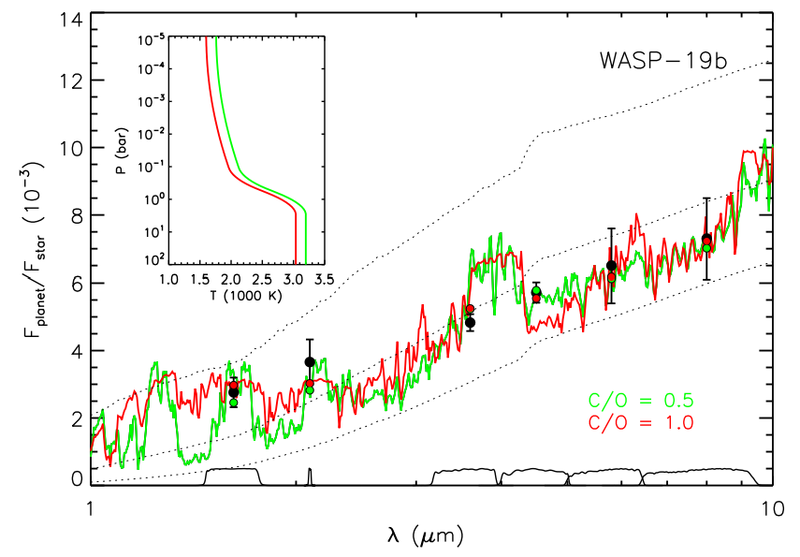 The authors of this paper determine that Wasp-19b, a hot Jupiter orbiting an active star, does not display a strong temperature inversion. In fact, it appears to display no temperature inversion at all. Why do some hot Jupiters have strong temperature inversions, while others do not? Figure 1. Transits of Wasp 19b at 3.6 (purple), 4.5 (blue), 5.8 (green) and 8.0 (red) microns observed by warm Spitzer. Left: the raw data, not binned. Center: The data are binned. 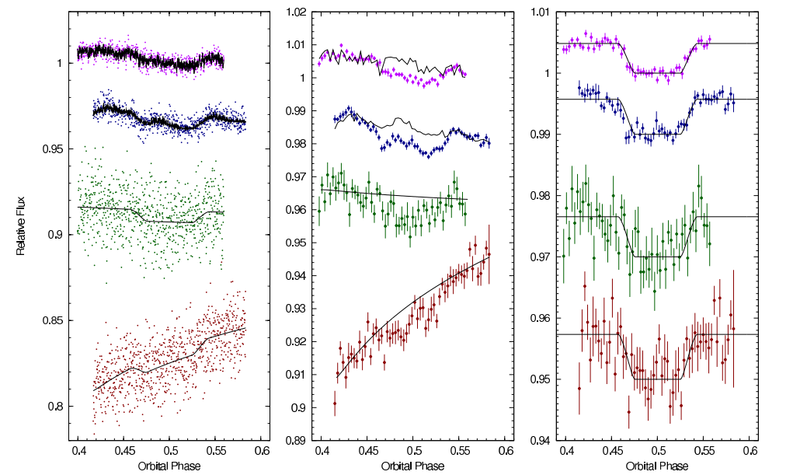 A model of the systematic trend due to pointing offsets and CCD gain has been fit to each transit (black). Right: the systematic trend has been removed. Each transit is fit with a model transit (black). Figure 2. Measurements of the planet flux (black) and model spectra of non-inverted atmospheres that are carbon- (red) and oxygen-rich (green). Red and green points correspond to the predicted flux measurement for the carbon- and oxygen-rich atmospheres based on integrating those spectra under the various bandpasses. What’s the upshot of all this? Well, we can’t determine the composition of Wasp-19b, since either a carbon- or oxygen-rich spectrum produces the observed lack of temperature inversion. However, the absence of a temperature inversion is itself interesting. Why do some Jupiters have temperature inversions, while others do not? The authors refer to a hypothesis that active stars prevent the formation of temperature inversions in hot Jupiters (Knutson, Howard & Isaacson, 2010). Wasp-19 is indeed an active star. However, we will need to wait and see whether this relation between temperature inversion and stellar activity holds for a significant number of un-inverted hot Jupiters and their active hosts (right now there are five such examples). Whatever the reason, Wasp-19b has no temperature inversion, which means that it can’t hold a global smog. So the next time my grandfather feels the need to move cross-country (or cross-galaxy), I have at least one suggestion of a place with clean air.